^ Hardesty 2003, pp. 31–32. ^ "Mayflower Of The Air Ready For President." Popular Mechanics, May 1933. ^ Donald 1997, p. 364. ^ Hardesty 2003, p. 38. ^ Hardesty 2003, p. 39. ^ a b c "Factsheet: Douglas VC-54C SACRED COW." National Museum of the United States Air Force. Retrieved: 19 October 2009. ^ a b c Dorr 2002, p. l34. ^ Petersen, Ralph M. "53-7885 c/n 4151." Lockheed Constellation Survivors. Retrieved: 16 July 2013. ^ "First of 3 Jets for President and Top Aides Is Unveiled." The New York Times, 28 April 1959, p. 3. ^ Walsh 2003, p. 63. ^ Thomma, Steve. 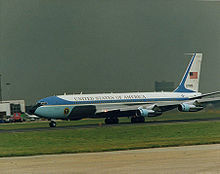 "Presidential Plane Heads for History; This Air Force One Served Every President Since Kennedy. A Museum is Next." The Philadelphia Inquirer, 20 May 1998, p. A14. ^ Jenkins 2000, pp. 55–56. ^ Trimble, Stephen. "US considers Airbus A380 as Air Force One and potentially a C-5 replacement." Flight Global, 17 October 2007. Retrieved: 6 December 2016. ^ "AF Identifies Boeing 747-8 platform for next Air Force One." United States Air Force, 28 January 2015. Retrieved: 28 January 2015. ^ Capaccio. Anthony. "Boeing to build Air Force One replacement with bids for systems." Bloomberg News, 28 January 2015. Retrieved: 25 April 2015. 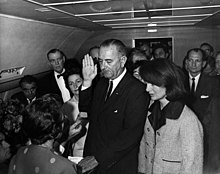 ^ "Lyndon B. Johnson National Historical Park." Aviation Museums. Retrieved: 7 July 2012. Abbott, James A. and Elaine M. Rice. Designing Camelot: The Kennedy White House Restoration. New York: Van Nostrand Reinhold, 1998. 0-442-02532-7. Albertazzie, Ralph and Jerald TerHorst Flying White House: The Story of Air Force One. New York: Coward, McCann & Geoghegan, 1979. 0-698-10930-9. Donald, David, ed., The Complete Encyclopedia of World Aircraft, New York: Barnes & Noble Books, 1997, 978-0-7607-0592-6. Dorr, Robert F. Air Force One. St. Paul, Minnesota: Motorbooks International, 2002. 0-7603-1055-6. Hardesty, Von. 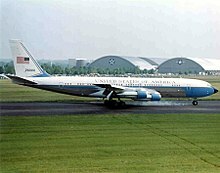 Air Force One: The Aircraft that Shaped the Modern Presidency. Chanhassen, Minnesota: Northword Press, 2003. 1-55971-894-3. Johnson, Lyndon Baines. The Vantage Point: Perspectives of the Presidency, 1963–1969. New York: Holt, Rinehart, & Winston, 1971. 978-0-03084-492-8.